Andrew Tristram Hinshaw1,10 [Andrew J. Hinshaw3,11, Andrew G. Hinshaw11,12]. Henshaw, Andrew, head-of-household, age 24, born in Indiana; parents born in North Carolina; farmer. Henshaw, Belle, wife, age 21, born in Indiana; keeping house. Henshaw, Sylvia, daughter, age 3, born in Indiana; parents born in Indiana. Henshaw, Florance, daughter, age 1, born in Indiana; parents born in Indiana. 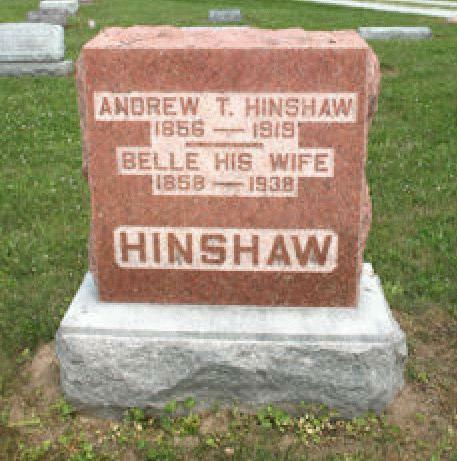 Hinshaw, Andrew, head-of-household, age 43, born April 1856 in Indiana; parents born in North Carolina; married 24 years; occupation: farmer; rented farm. Hinshaw, Belle, wife, age 41, born Oct 1858 in Indiana; parents born in Indiana; married 24 years; 7 children, 7 living. Hinshaw, Walter, son, age 19, born Aug 1880 in Indiana; parents born in Indiana; occupation: farm laborer. Hinshaw, Dougan, son, age 17, born Oct 1882 in Indiana; parents born in Indiana; attended school 6 months. Hinshaw, Clarence, son, age 15, born Nov 1884 in Indiana; parents born in Indiana; attended school 6 months. Hinshaw, Raymond, son, age 13, born Mar 1887 in Indiana; parents born in Indiana; attended school 6 months. Hinshaw, Bennie, son, age 11, born Feb 1889 in Indiana; parents born in Indiana; attended school 6 months. Hinshaw, Andrew T., head-of-household, age 56 [unclear], born in Indiana; parents born in North Carolina; first marriage, married 35 years; occupation: running school wagon [unclear]. Hinshaw, Bell, wife, age 51, born in Indiana; parents born in Indiana; first marriage, married 35 years; 7 children, 7 living. NOBLESVILLE -- Andrew Hinshaw, 60 years old, one of the principal land owners in Hamilton County, died Monday. Among the children who survive are Benjamin Hinshaw of Indianapolis, Clarence H. [sic] Hinshaw of Kokomo, Mrs. Orva Fouch and Mrs. Lemuel Venable of Sheridan, Walter H. [sic] Hinshaw of Castleton, and Bougan [sic] Hinshaw of McCordsville. Hinshaw, Belle, head-of-household, age 71, born in Indiana; parents born in Indiana; widow; rented home ($9 rent); no radio in home; occupation: none. Montgomery, Lillie, roomer, age 64, born in Indiana; parents born in Indiana; widow; occupation: housekeeper, private home. Indiana Marriages, 1845-1920; http://www.ancestry.com (Book C-4, page 10). Indiana Marriages, 1845-1920; http://www.ancestry.com (Book 5, page 186). 1910 census, Washington Township, Hamilton County, Indiana; roll T624-353, ED 111, page 254A, line #32, dwelling #157, family #159. Contribution from Donna M Berry citing: gravestone. 1900 census, Washington Township, Hamilton County, Indiana; roll T623-375, ED 92, page 6B, line #70, dwelling #141, family #146. 1910 census, Washington Township, Hamilton County, Indiana; roll T624-353, ED 111, page 254A, line #30, dwelling #156, family #158. Death notice for Andrew Hinshaw; "The Indianapolis Star", May 20 1919; http://www.ancestry.com. 1930 census, Carmel, Hamilton County, Indiana; roll T626-590, ED 6, page 1A, line #22, dwelling #6, family #10.